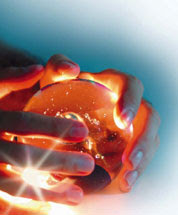 The West Central Blogger: Take time for a little crystal ball gazing ... and more. Take time for a little crystal ball gazing ... and more. The folks in west central Minnesota have a tremendous opportunity not just to see into the future, but to create it. The eighth annual Workforce Solutions Conference, "Creating the Future," will be held Wed., April 18, from 8:30 a.m.-3 p.m. at the Bigwood Event Center in Fergus Falls. Futurist Ed Barlow from Creating the Future, Inc., is the guest speaker and the day's facilitator. Ed has presented in Greater Minnesota before, and those we know who have heard him speak say his presentation is electrifying and galvanizing. He talks about trends and challenges the audience to do something about them/with them. So far, there's an eclectic group of participants: manufacturers, small business owners, healthcare professionals, city officials, educators and more. This dynamix mix should result in some spirited discussion and creative brainstorming. Interested? There's still time to register online or call 800-735-2239.